Abitibi-Témiscamingue, what’s that mean, exactly? Abitibi means place where the waters divide. The region is located on a watershed divide. A divide is a geographical limit that separates a territory into one or more drainage basins. The waters that flow north end up in Hudson’s Bay, while those that flow south empty into the St. Lawrence River. This phenomenon is explained – and seen – in the parc national d’Aiguebelle. Témiscamingue means place of deep waters. Lac Témiscamingue has an average depth of 120 metres. How do I get to the region? You can get here by car, bus, plain or train. Some also arrive on foot or by bicycle, but that’s another story. For more information, visit the Access and Transport page. Say you’re leaving from Montréal. 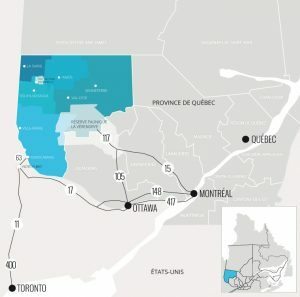 In that case, you’re a 1-hour flight away or 6 hours by road (whether you go through the Réserve faunique La Vérendrye and take the 117 to arrive in Val-d’Or, or go through Ottawa and take the 17 to reach Ville-Marie). People have a lot of preconceived notions about the Réserve faunique La Vérendrye, but we think it’s full of possibilities. Read: La 117… la voir autrement (IN FRENCH). As Jean Royal said so well: “Beyond the distance that separates [us] from major centres, [we] consider La Vérendrye park a way to find yourself, either alone or with a loved one” (read the rest IN FRENCH). Count on a few hours more if you come by bus, a delay largely compensated by being able to access free WiFi the whole way. You can take care of business in peace. As for the train, you have to consider it an experience in itself. It’s a unique way to enter a region as full of mystery as ours. We invite you to read author Jocelyne Saucier’s account of her train adventure Montréal-Senneterre, voyage dans un train mythique (IN FRENCH). The article appeared in the magazine L’actualité in June 2012. Will I be able to gas up along the way? No worries. Along the road, the longest distance between two gas stations is 150 km. So it does take a minimum of organization. The community of Le Domaine awaits you in the Réserve faunique La Vérendrye. Obviously, if you make the trip at night, you’ll have to plan a bit more. Some service stations close at 11 p.m., as they do across Québec. Yes, of course. Always… 😉 Well no, but let’s be frank. It’s a lot nicer than it seems. In summer, we enjoy extended daylight (until 11 p.m. in June). The mercury can also top 30 degrees. The average ranges from 20 to 25 degrees. It’s perfect for plunging into all kinds of outdoor activities and the dozens of festivals around the region. And for those who asked, yes, we do go swimming in summer. We have at least two good months for it. It’s hot; the lakes are cool… Perfect! Fall comes a good two weeks sooner than in southern Québec. So you can enjoy the fall colours in September. The first snow flies (it’s a tradition) on opening night of the Festival du cinéma international en Abitibi-Témiscamingue, the last Saturday in October. But it doesn’t stay on the ground. That starts in December. Here, we want a white Christmas! It’s true that the mercury can dip to -30°, which feels like -40° with the wind. But that’s just a few mornings each winter. On those days, there’s no school, and we take the opportunity to cocoon. Generally, the temperature hovers around -20, and we shift among snowmobiling, skating, hockey, ice fishing, snowshoeing, cross-country skiing, dog sledding, etc. We really have nothing to complain about. The snow usually melts in April, marking the arrival of spring, which smells here of lilac and spruce! The best tip we can give is to forget any wild ideas you may have about Abitibi-Témiscamingue and rely on the weather forecasts. Before you leave, check the Environment Canada Web site. For the rest, we suggest you plan as needed, so you’re well prepared for your favourite activities. Hiking? A good pair of running shoes. Going to H2O le festival? Your bathing suit. Dog sledding? Boots, snow pants, winter coat, tuque, mitts, scarf, et al. What types of accommodations will I find? Hotels, motels, cabins, lodges, youth hostels, campgrounds, yurts and teepees are all available in Abitibi-Témiscamingue. Our accommodation offerings have undergone some major renovations in recent years, making them among the most up-to-date in Québec. Of course! And the best thing is that places (cities, villages, restaurants, hotels, etc) that have service (i.e. most) offer it for FREE! But of course, you’re somewhat less likely to find WiFi when hiking the hill trails of Kékéko, in the tents of Huttopia, in parc national d’Aiguebelle or when fishing in the middle of a lake. But hey! You do come here to get away from it all, right? Oh yeah! And getting better all of the time! The region is extraordinarily dynamic. Several new restaurants have opened their doors in recent years. They’ve really spiced up the offer. The chefs entertain themselves by working with local products, and show imagination and originality. They’re friendly with their customers, and the welcome is real and warm. There’s something for every taste, whether you’re looking for fine dining, exotic dishes, places that have been around since grandma’s time, atmosphere, breakfast spots, intimate cafés or a microbrewery. We’re a long way from the days when rural communities meant fast food or big-chain restaurants. The classic dish is eaten at an outfitter’s lodge after a day of fishing. They’ll tell you there’s nothing like a walleye freshly snatched from the water. It melts in your mouth! There are several “musts”: La Cité de l’Or mining village, Refuge Pageau wildlife refuge, La Troupe À Cœur ouvert theatre troupe, the parc national d’Aiguebelle and the Fort-Témiscamingue/Obadjiwan National Historic Site. And besides all of that, there are other attractions aplenty, each more fun, informative and unique than the next. A great way to grasp or understand Abitibi-Témiscamingue. There are dozens of festivals and events. You’ll enjoy experiences you won’t find anywhere else. Obviously, there’s an incredible array of outdoor activities available. For inspiration, check out AccesPleinAir.org. Great hunting and fishing abound. There are over a hundred outfitters in the region. 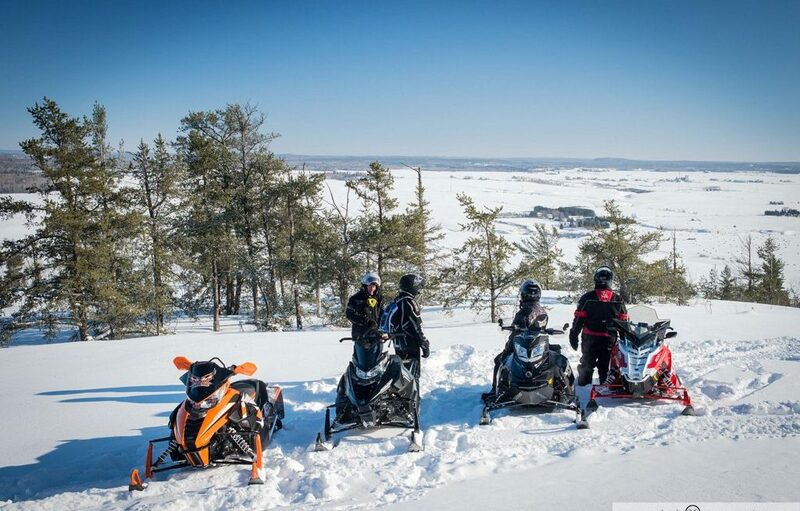 Abitibi-Témiscamingue is an excellent place to enjoy winter, and the top snowmobiling destination in North America. Absolutely. You’ll find CLSC (local community-services and health centres) in smaller towns, hospitals in all of the bigger cities (Val-d’Or, Amos, La Sarre, Rouyn-Noranda, Ville-Marie). You’ll also find emergency plans at AccesPleinAir.org, to make sure all goes well for your self-guided outdoor activities. When is the best time to see shooting stars? Far from urban light pollution, Abitibi-Témiscamingue is an amazing location to watch the heavens move during the Perseid meteor shower. You can see debris from Comet Swift-Tuttle when it reaches the earth’s atmosphere between July 20th and August 25th. This phenomenon should reach its peak between August 11th and 15th. Where can I find out the snowmobile trail conditions? Trail conditions are published on our Web site. They are updated regularly by the volunteers who valiantly maintain our 3,700 km network. What famous personalities are from Abitibi-Témiscamingue? Of course! When you come here, let us know. Share your experiences using the hashtag #ExperienceAT.